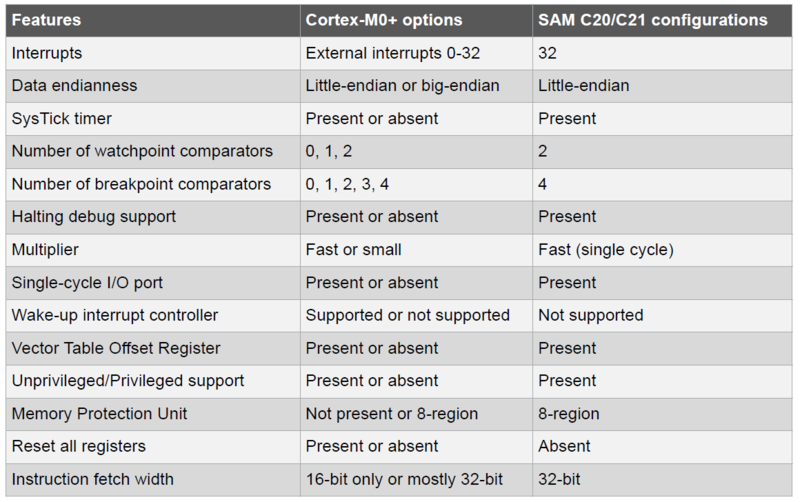 The SAM C21 implements the Arm® Cortex®-M0+ processor, based on the Arm v6-M Architecture and Thumb®-2 ISA. The Cortex M0+ is 100% instruction set compatible with its predecessor, the Cortex-M0 core, and upward compatible to Cortex-M3 and M4 cores. The Arm Cortex-M0+ implemented is revision 'r0p1'. This is the specification of the architecture on which the Cortex M0+ is based. It covers detailed information about the programmer's model. Targeted for application software developers, it provides information on the programmer's model, details on using the core peripherals such as NVIC, and general information about the instruction set. Targeted for silicon designers, this document contains implementation-specific information, such as instruction timing, and some of the interface information. The processor provides debug through registers in the SCS. Refer to the "Cortex-M0+ Technical Reference Manual" for details. The System Timer is a 24-bit timer that extends the functionality of both the processor and the NVIC. Refer to "System Timer (SysTick) Overview" and the "Cortex-M0+ Technical Reference Manual" for details. External interrupt signals connect to the NVIC and the NVIC prioritizes the interrupts. The software can set the priority of each interrupt. The NVIC and the Cortex-M0+ processor core are closely coupled, providing low latency interrupt processing and efficient processing of late arriving interrupts. Refer to the "Cortex-M0+ Technical Reference Manual" for details. The Cortex-M0+ processor implements a dedicated, single-cycle I/O port bus for high-speed, single-cycle access to peripherals. The single-cycle I/O port is memory mapped and supports all the load and store instructions. This bus is used on SAM C21 to provide single-cycle access to the GPIO ports. The System Control Block provides system implementation information and system control. This includes configuration, control, and reporting of the system exceptions. Refer to the "Cortex-M0+ Devices Generic Users Guide" for details. The CoreSight™ MTB-M0+ (MTB) provides a simple execution trace capability to the Cortex-M0+ processor. Refer to the "CoreSight MTB-M0+ Technical Reference Manual" for details.